Most decals indicating that there’s a family on board are boring and of the serious type. 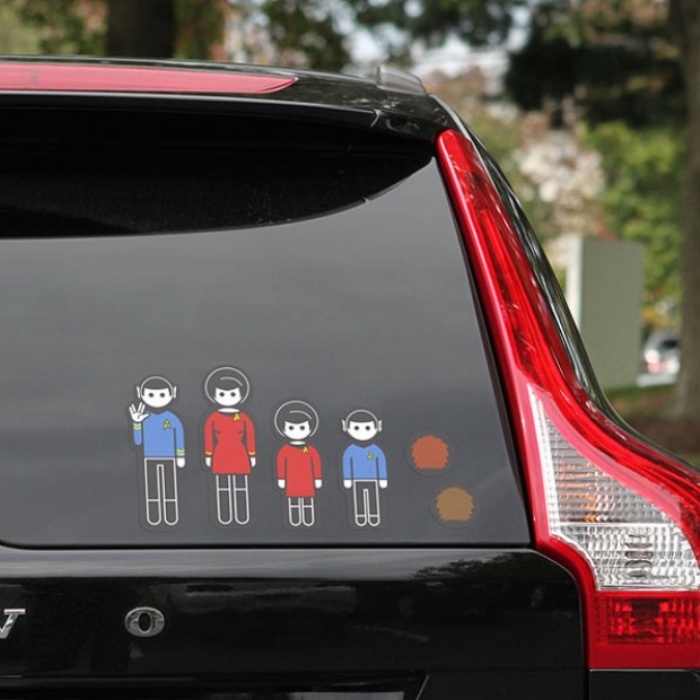 If you’re looking for something different, then you might want to get these Star Trek decals instead. They weren’t exactly made for that purpose, but hey, no one’s stopping you if you want to use it that way. They’re actually sold in sets of 32 decals, where 23 of these are based on characters from Star Trek: The Original Series. Mix and match and throw in some random Tribbles when you feel like it (there are actually five of those included in every set). Each set is priced at $14.99. By Hazel Chua on 12/06/13 • Leave a comment! Who can ever forget George Takei or the role he played on Star Trek? Now he’s going on the path that other big stars have…with the release of his own brand of perfume! It’s called “Eau My” (oh my!) and comes packaged in a regular-looking bottle that’ll give you a whiff of what Takei might actually smell like. Well, either that, or what he thinks smells good, anyway. 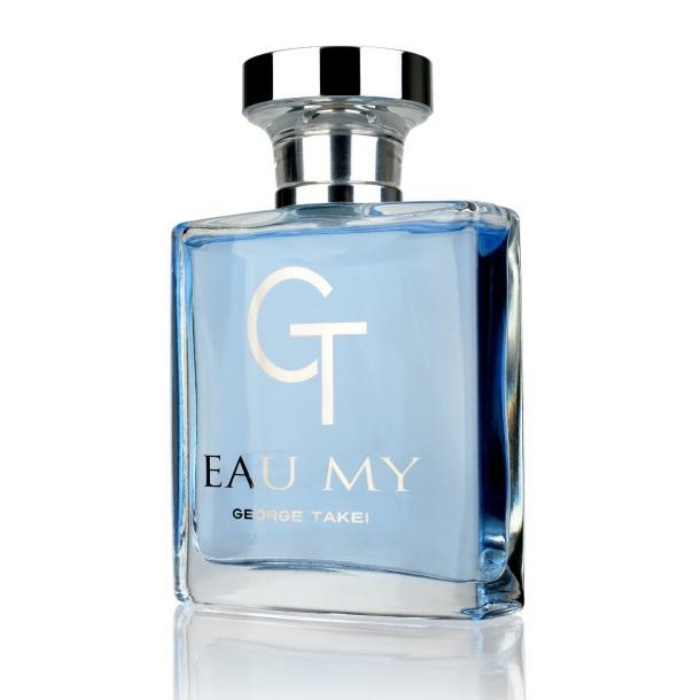 George Takei’s Eau My is subtle and charming, with top notes of mandarin zest, Italian bergamot and fresh ozone transitioning to night-blooming jasmine, white freesia petals and grated ginger. Sensual woods, crystalized amber, soft skin musk, and vetiver will delight you when dry. Google has always known as the search engine giant, but is its stranglehold slowly slipping away? 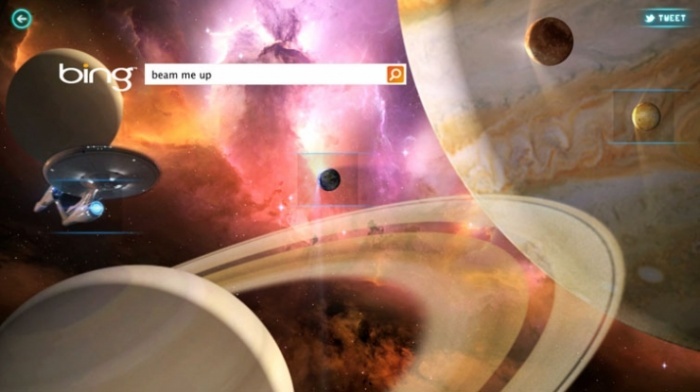 Bing is on the rise as it accounts for 25.6 percent of the search results in the US. Perhaps in a bid to further cement their popularity (and following Google’s footsteps somewhat with interactive search), Bing has unveiled interactive Star Trek-themed search results that’ll beam you up to a different galaxy on the interwebs. Or should I say, Bing you up? Just type in “Beam me up” on Bing.com’s homepage and you can see what I’m talking about for yourself. This is a short commercial for this outfit called Dodds Furniture And Mattress in Victoria, BC. The geek angle? It’s got a Star Trek theme. The better geek angle? It’s the most atrocious thing we’ve ever seen. By Andrew Liszewski on 09/12/11 • Leave a comment! These electronic versions of 20 questions, which seem to magically guess what you’re thinking by asking a maximum of — wait for it — 20 questions, are nothing new. 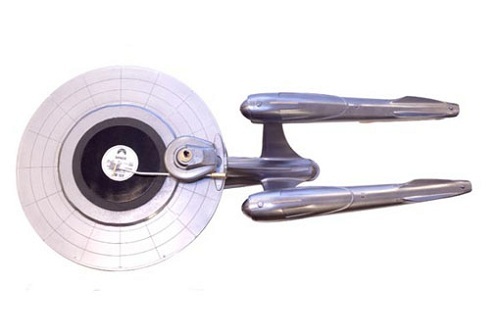 But one that’s geared towards Star Trek fans and looks like a miniature version of the USS Enterprise? Well that’s something to note in your captain’s log. Fans of the newer series like TNG or DS9 might be disappointed to learn the game only covers characters and facts from the original Star Trek series and movies. But there’s still plenty of storylines to keep this thing interesting for at least the length of a drive to a Trekkie convention. Available from Amazon for just $8.75. By Chris Scott Barr on 11/24/10 • Leave a comment! 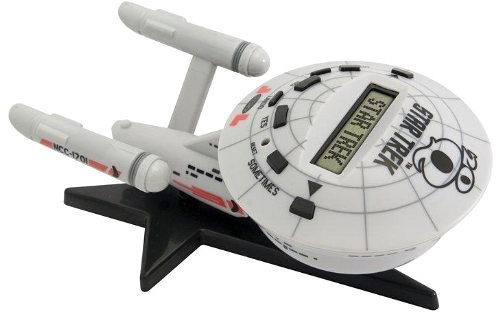 Do you like Star Trek and have a fascination with do-it-yourself projects? Then I’ve got just the thing for you. 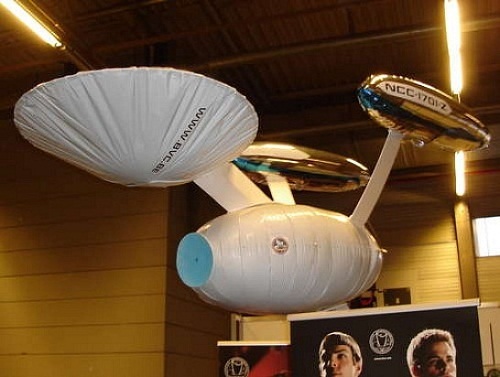 It’s an R/C Starship Enterprise Zeppelin. That’s right, this baby actually flies! Granted, it might not be the most perfect replica of the famed ship, but it does bear a striking resemblance to the one seen in the original TV series. It’s not going to take a rocket scientist to get this project off the ground, but you might not want to tackle this if you’ve not messed around with R/C devices before. Thankfully, there are detailed instructions over at Instructables, so if you’re feeling adventurous, you can craft one for yourself. Hailing from the Midwest means that I’ve really never had a reason to own a wetsuit. 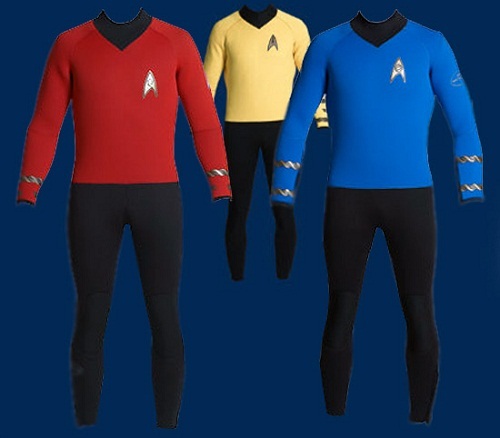 However, for those of you that happen to spend a lot of time in waters that require such protection, I give you the Star Trek Wetsuit. If you have the need to show your love of the original series even while underwater, then these are for you. These 7MM suits are tailored specifically to your exact measurements and supplied by JMJ Wetsuits. At $470 a pop, you’ll be paying around a hundred bucks extra for the Star Trek theme. The traditional yellow, blue and red uniform colors are available, though no sane person would dare jump in the water in a red suit. That’s just asking for trouble. 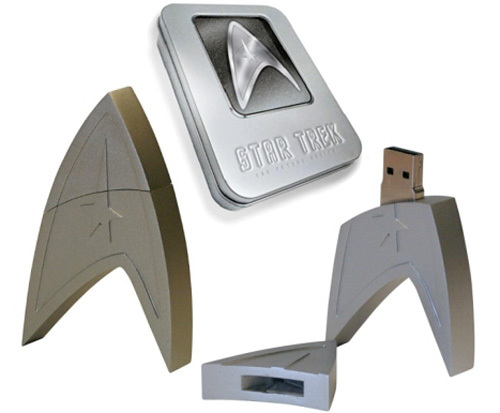 I’ll spare you my thoughts on the new Star Trek film, given this isn’t a movie-review site, and I seem to stand in the minority with my opinions, but if you were a fan of Abrams take on the Trek universe you might be interested in this limited edition version of the film which comes on a 4GB Starfleet insignia flash drive. (Each one is individually numbered.) The digital copy of the film is all DRM’d up so it can only be played on up to 5 registered devices, or burned to a DVD, and it’s about 1GB in size, leaving you 3GB of storage to boldly store what no man has stored before. ~$28 from Play.com. I’m always on the lookout for cool new Star Wars merch to decorate my place with. It’s what we geeks do. I’m not a big fan of the Trek, but I know that some of you are, so I thought I’d pass along this little gem. It’s a record player that’s shaped very much like the classic USS Enterprise from the original Star Trek TV show. It really makes perfect sense, as the whole front of the ship is shaped like a giant disc. This is one of those creations that inspires facepalms from people saying “why didn’t I think of that?” For now this would seem to only be a concept, but I’m sure that some enterprising fellow could actually produce a few of these and make a mint.